DACA was designed to protect people brought to the United States as children by undocumented parents from deportation and gave them work permits. 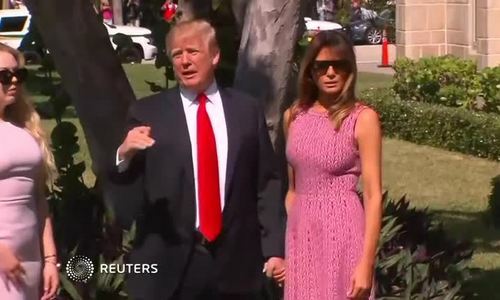 President Donald Trump said on Sunday that there will be no deal to legalize the status of young adult immigrants called Dreamers and he said the U.S.-Mexico border is becoming more dangerous. After tweeting a “Happy Easter” message on Twitter, he said: “Border Patrol Agents are not allowed to properly do their job at the Border because of ridiculous liberal (Democrat) laws like Catch & Release. Getting more dangerous. “‘Caravans’ coming. Republicans must go to Nuclear Option to pass tough laws NOW. NO MORE DACA DEAL!” he wrote, adding a threat to kill the North American Free Trade Agreement which is being renegotiated with Mexico and Canada. Mexico’s presidential front-runner, Andres Manuel Lopez Obrador, launched his campaign close to the border on Sunday demanding respect for Mexicans and signaling he may take a harder line toward Trump if he wins the July 1 election. More than 1,000 would-be migrants have passed through Mexico’s southern states of Chiapas and Oaxaca in recent days in a so-called “refugee caravan” organized by U.S.-based immigrant advocacy group Pueblo Sin Fronteras. In the town of Ixtepec, more than 1,500 men, women and children from Honduras, El Salvador and Guatemala waited in a sweltering warehouse on Saturday, mattresses rolled and bags packed, as local authorities and immigration officials from Mexico’s federal government organized 15 buses to take them to their next stop on the long journey north. Gina Garibo, a member of Pueblo Sin Fronteras traveling with the migrants, said the group would hold a meeting to discuss Trump’s statements on Sunday and stressed that the caravan’s aim was to protect vulnerable people. “The main people here are fleeing criminal violence, political violence, in their country and this allows us to save lives,” she said in response to Trump’s comments. A guest on Sunday’s Fox & Friends show, Brandon Judd, head of the National Border Patrol Council union, said illegal immigrants benefit from the “catch and release” program that Trump referenced in his tweet. Under it, they can be freed while awaiting court hearings if detained in the United States. “An inaccurate news report should not serve to question this strong cooperation. Upholding human dignity and rights is not at odds with the rule of law. Happy Easter,” he said in a tweet.